The magic and merriment of Christmas time can inspire child-like wonder in all of us: the presents, sparkling lights and dazzling decorations, special foods, the excitement and anticipation that grow at this special time of year. But as Elmo, Big Bird, Cookie Monster, and their friends from Sesame Street® learn, Christmas is so much more than that. It’s a time for kindness and generosity, for being with friends and family. It’s a time for spreading peace and goodwill. It’s a time of love. 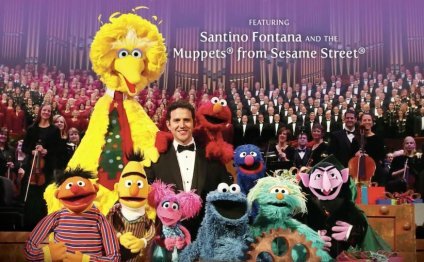 In this live recording from the concert, the Mormon Tabernacle Choir, Orchestra at Temple Square, and Bells on Temple Square join with Broadway star Santino Fontana and the Muppets® from Sesame Street® to sing joyfully of the magic of Christmas and the excitement of its traditions. Abby Cadabby and Rosita enjoy singing with the Choir at Christmas and learn how to keep the beautiful feelings alive after the celebrations are over. Bert and Ernie learn from Santino Fontana that singing and sharing a little bit of themselves can be important, too. Count von Count assists organist Richard Elliott in one of the beloved traditions at these concerts, a virtuosic organ celebration of Christmas melodies. Even Cookie Monster comes to understand that sharing his precious cookies with friends brings its own kind of contentment.